Negociações de Paz… Que Paz? Ok, vários dias sem atualizar o blog… Desculpem! Estive fora, participando do Simpósio comemorativo dos 50 anos do Colégio Interamericano de Defesa, em Washington, DC. Daí a dificuldade em manter o site em dia! Depois comento mais sobre o evento, onde se discutiu o futuro da cooperação hemisférica em segurança e defesa pelos próximos 50 anos. 1 – Questionável a decisão do Governo de negociar com as FARC. Especialistas estão divididos a esse respeito, pois a iniciativa de Santos pode sinalizar fraqueza. 2 – O Governo colombiano encontra-se fragilizado com a doença do Presidente, acrescida da isquemia cerebral do vice e de questinamentos sobre a sanidade do segundo na linha de sucessão, o Presidente da Câmara. 3 – Há quem diga que as medidas de Santos iriam de encontro às iniciativas de Uribe (de não negociar com as FARC, mas sim esmagá-las) e mesmo comparam o atual Presidente ao anterior a Uribe, Andrés Patranas. Negotiators from the Colombian government and left-wing Farc rebels have set the stage for their first direct talks for a decade. After almost 50 years of conflict, the two sides launched the peace process at a hotel in Norway, with negotiations expected to last months. Colombia’s negotiator said both sides agreed on the need for social change. Farc delegation head Ivan Marquez said they came “with an olive branch” but peace did not mean “arms go quiet”. ‘Stable and lasting peace’A joint declaration by both sides was read out, agreeing to launch the talks in Norway and then move on to the Cuban capital Havana next month. Colombian chief negotiator Humberto de la Calle told reporters that Thursday’s talks were “a very important historical moment” and the second part of a process that began with exploratory negotiations in February. The third step would be the signing of an agreement to “put an end to armed conflict”, Mr de la Calle said, adding that the final agreement would be “put to the public”. Speaking for the rebels on the same podium, Mr Marquez told reporters: “We come with an olive branch in our hands.” He insisted that the Farc was seeking a “stable and lasting” peace. Three attempts have already been made to end the conflict, the last initiative falling apart in 2002, three years after it began. The launch of the talks started with a news conference at a hotel in Hurdal 40 miles (60km) north of Oslo, involving intermediaries from both Norway and Cuba, the two countries acting as guarantors of the process. The negotiations are due to focus on five key areas: the end of armed conflict; land reform; guarantees for the exercise of political opposition and citizen participation; drug trafficking; and the rights of the victims of the conflict. But the joint statement spelt out that rural development would be the first issue addressed and would be dealt with from 15 November in Havana. Land reform was a major reason for the uprising that brought about the Farc’s establishment in the early 1960s. 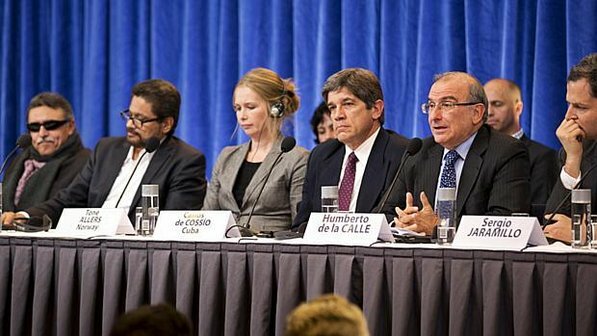 Mr Marquez, Farc’s deputy leader, told reporters that much of Colombia’s land had been “stolen by state terrorism”. Poverty affected 70% of Colombians, and 12 million of them lived in extreme poverty, he said. 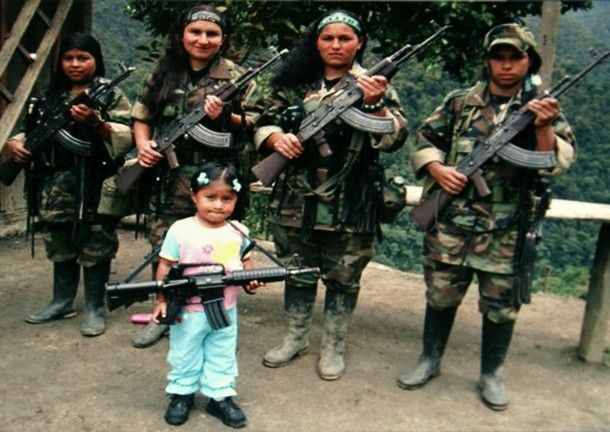 The Farc originally set out to overthrow the government and install a Marxist regime, but in recent years has become increasingly involved in the drug trade to raise money for its campaign. ‘No demobilisation’Mr Marquez said his colleagues had come to Norway to find a political solution to Colombia’s civil war that would bring a thorough demilitarisation of the state. But he said his movement had no intention of demobilising. The BBC’s Arturo Wallace in Bogota says that the two chief negotiators appear to have very different conceptions of how the process will unfold. The Colombian government wants the Farc to lay down its weapons, with structural issues coming later in the third phase of the process, while the rebels want to use the current phase to discuss structural change, our correspondent says. The Farc, who numbered 16,000 in 2001, are now thought to have 8,000 fighters. Colombian President Juan Manuel Santos has rejected rebel calls for a ceasefire, saying military operations would continue until a final agreement was reached. Farc leader Alfonso Cano, who began the current process with the government, was killed in a bombing and ground raid by government forces in November 2011. Clashes between the rebels and Colombian forces have continued, despite the signing of an agreement in August spelling out the principles and procedures for the talks. Esse post foi publicado em Defesa, Segurança e Defesa e marcado acordos de paz, COlombia, FARC, guerra civil colombiana, negociacoes Colombia, Oslo, Santos, Uribe por Joanisval. Guardar link permanente.